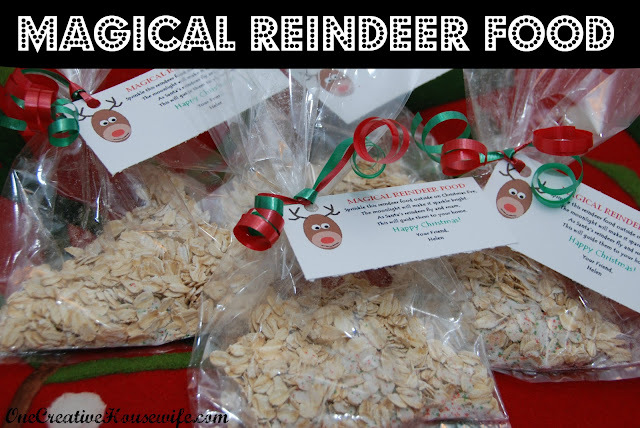 My kids and I make magical reindeer food every year, because they love putting food out for Santa's reindeer on Christmas Eve. This year I decided to give it to their classmates as a cute little holiday treat. I found free printable tags from Tomkat Studio, but I wanted to alter the saying a little so I made my own. The reindeer is just a shape I made in the Paint program on my computer. Feel free to print the tag for your own use. Just right click on the image, then save it to your computer. I just open it in Word or Publisher and copy the image for each tag I want to print. 1. In a large bowl mix the sugar and sprinkles. 2. Place 1/4 cup of oats in a each gift bag. 3. 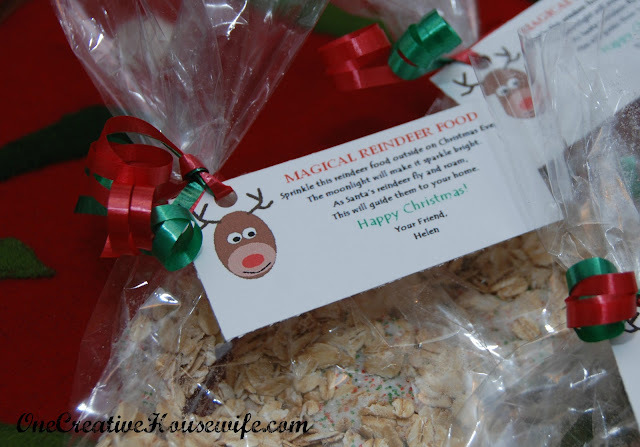 Place 1 Tablespoon of the sugar mixture in each gift bag. I use to use glitter instead of sprinkles, but I found out that the glitter can harm our little woodland friends. My kids love putting this out with some carrots for the reindeer. It even gets better when something around here actually eats it! Perfect for Christmas Eve! Can't wait to make these with my kids. 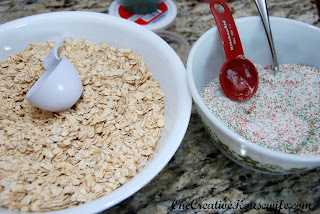 I even have some Oats that I am pretty sure just expired and this a perfect way to use them. Pinning! Thanks! Your kids will love it! Have a great Christmas! Good to know about the glitter. My son made this with glitter in school, so think I will make some with sprinkles instead. We live on a conservation with tons of wildlife! Thanks for sharing.